At stake is a government drive to cut an unemployment rate that’s higher than the national average of 25.6 percent in Karoo, an arid area the size of the U.S. state of Montana with little economic activity. The shale industry could be a “game changer” for the economy, Trade Minister Rob Davies said in parliament on Aug. 22. Exploration regulations may be passed by the end of the current government’s term in April next year. South Africa’s shale reserves, concentrated in the Karoo, could be the world’s eighth-biggest behind countries like China, where Shell plans to invest in the industry, and the U.S., where it’s already producing the gas, the U.S. Energy Information Administration said in June. Gas is more efficiently pumped from shale using hydraulic fracturing, or fracking, where pressurized water, chemicals and sand are injected underground to shatter rock and release the fuel that’s trapped. Opponents including Douglas Stern, a member of Agri Eastern Cape, representing more than 3,000 landowners in the province, say fracking could cause pollution, threatening the Karoo. The region covers about a third of South Africa, with its landscape of sparse grass and shrubs supported by annual rainfall that can be less than four inches, drier than California’s Mojave desert. South Africa as a whole averages about 18 inches of rainfall a year, according to the government. “We’re going to be polluting our water,” Stern said in an interview. Farmers like van der Merwe, who owns 3,200 sheep, fear that the drilling could end the lifestyle that some of their families have had for more than a century. As one of the least-populated areas in the country, the Karoo produces most of South Africa’s wool and accounts for the bulk of the country’s mohair output, export industries worth about $330 million. Buyers include luxury suit-maker Ermenegildo Zegna SpA. The region also produces sheep and ostrich meat. Rupert, whose controlling stake in luxury goods-maker Cie. Financiere Richemont AG accounts for two thirds of his $8.4 billion fortune, owns land in the area and is “very actively involved in opposition to fracking,” Derek Light of Graaff-Reinet-based Derek Light Attorneys, representing the billionaire and 400 landowners, said by phone. Rupert didn’t respond to requests for an interview. “There will be pollution causing a loss of air quality and potential contamination of groundwater,” Light said in an e-mail. “These activities will impact negatively on agriculture and undermine food security” and tourism will be damaged, he said. Shell plans to bring in water from sources including the sea in “the initial exploration” period, and “local experts” will be consulted prior drilling each well, it said on its website. Shell has said it won’t compete with local communities for fresh water, and that farmers may benefit from exploration. “There will be fair compensation for land owners, the land and the crops, and then there will be jobs for local communities,” Claude Vanqa, Shell’s community relations representative in the Karoo, told government officials May 23 in Fraserburg in the Northern Cape province. Shale gas could generate as many as 700,000 jobs in South Africa, according to Shell, which cited a study by Johannesburg-based Econometrix. Vanqa, who grew up in Beaufort West, in the Karoo about 400 kilometers northeast of Cape Town, has crisscrossed Shell’s 90,000-square kilometer lease area to make presentations to its 17 municipalities. 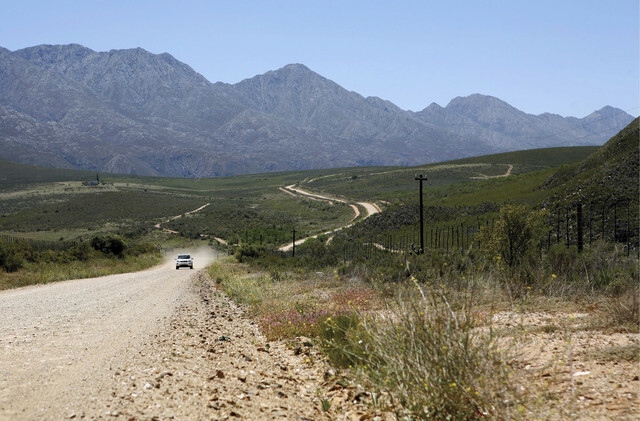 “We hope to be granted an exploration right within months,” Janine Nel, a spokeswoman for the Hague-based company, said by e-mail. “The inter-departmental task team to establish best practices for hydraulic fracturing hasn’t finished their work,” Trevor Hattingh, a spokesman for the Department of Mineral Resources, said by text message. Minister Susan Shabangu is “in favor of the opportunities it can unlock” and considerate of its impact on society and the environment, he said. Falcon Oil & Gas Ltd. (FO), which was granted a technical cooperation permit in 2009 for 30,000 square kilometers and has a partnership with Chevron Corp. (CVX), is also waiting for permits. Bundu Oil & Gas Exploration Pty Ltd., owned by Melbourne-based Challenger Energy, has an application for about 4,144 square kilometers. Production could start within 10 years, adding to energy options in South Africa which relies on coal-fired plants for 85 percent of its 41,900 megawatts of installed electricity capacity. Sasol Ltd. (SOL), based in Johannesburg, supplies more than a fifth of the country’s motor fuel by processing coal. Karoo municipalities have requested estimates from Shell on how many jobs the drilling would provide. Murraysburg had an unemployment rate of 36 percent, according to a 2011 study by the provincial government. “We were saying, in Fraserburg, the economy is not well,” Vanqa said at the meeting. The company has started a corporate social investment program in the Karoo. France, the Netherlands, the Czech Republic, Bulgaria and parts of Germany have restricted or banned fracking after public protests. Anti-shale demonstrators chained themselves to filing cabinets after breaking into the head office of U.K. explorer Cuadrilla Resources Ltd. in Lichfield, central England, on Aug. 19 as they widened a campaign against drilling. Another group superglued themselves to the office block housing the company’s public relations advisers. “If exploration licenses are issued to any company, we will immediately appeal that process,” said Jonathan Deal, who traded in his car this year for a Mercedes van covered with “Treasure the Karoo” stickers, the name of his group, and has campaigned in Karoo regions and towns. They will also sue the state, Shell and other explorers, he said. Landowners within the lease areas will probably only make a fraction of what people have been paid who sit above shale formations in Texas, Louisiana or Pennsylvania, because the farmers only hold surface rights while the government holds mineral rights.